I’ve been in the city a lot lately due to a new day job. While I usually make the trek out to the house on Friday nights, I decided to stay in the city this weekend. I had errands to run and I needed a break from the commute out the house. We were lucky enough to get a quick taste of spring this weekend, with temperatures in the 60’s and sunny skies above. So on Sunday afternoon I pumped up the tires on my bike and took myself out to soak up some springtime sunshine. It was on my ride that I discovered this gorgeous Prairie style home in Evanston, Illinois. 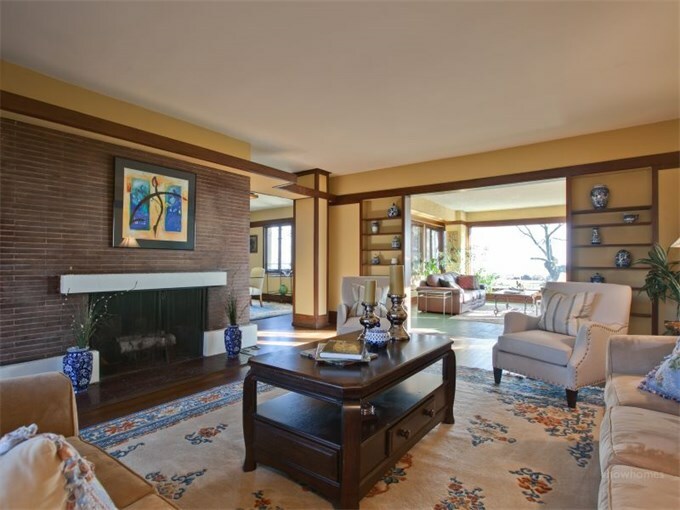 The house at 741 Sheridan Road was designed by John S. Van Bergen and, judging by the photos in the real estate listing, it’s everything that I want our house to be. I stopped in my tracks when I came upon the house at 741 Sheridan Road. Not only am I interested in Prairie style architecture, but this particular house is for sale! I stopped, snapped a photo and then pedaled my way back home, where I immediately searched for details on the house. The house was built in 1915, just two years before our ASB home. I can see some similarities between this house and the ASB homes that Wright designed. 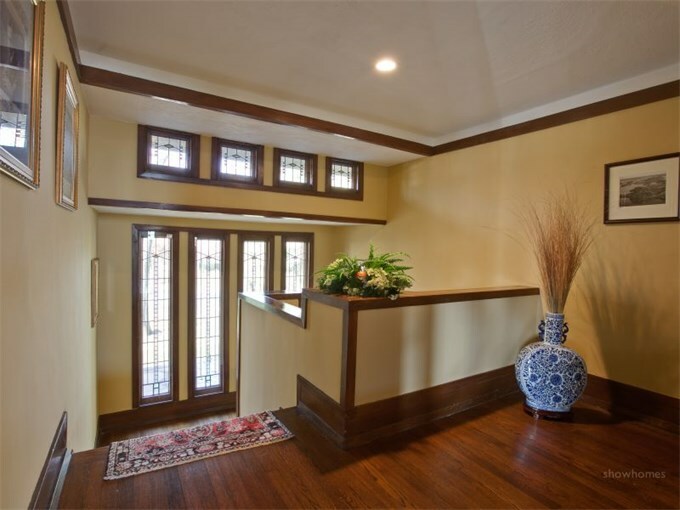 The wood trim and corner windows are hallmarks of the Prairie style, as are the stucco exterior and low roofline. For more information on the house at 741 Sheridan Road, check out the real estate listing at Sotheby’s. 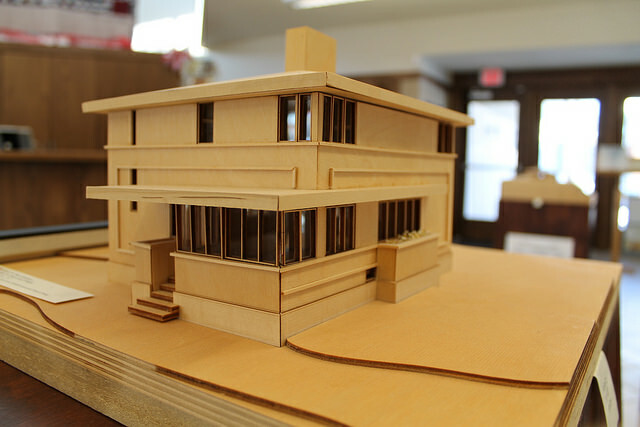 This entry was posted in architecture, Frank Lloyd Wright, Prairie School on 03/17/2015 by Jason. 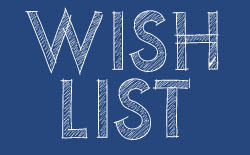 Since buying our American System Built house in Northeast Iowa last year, we’ve been planning to visit all of the other Frank Lloyd Wright-designed homes in the state. 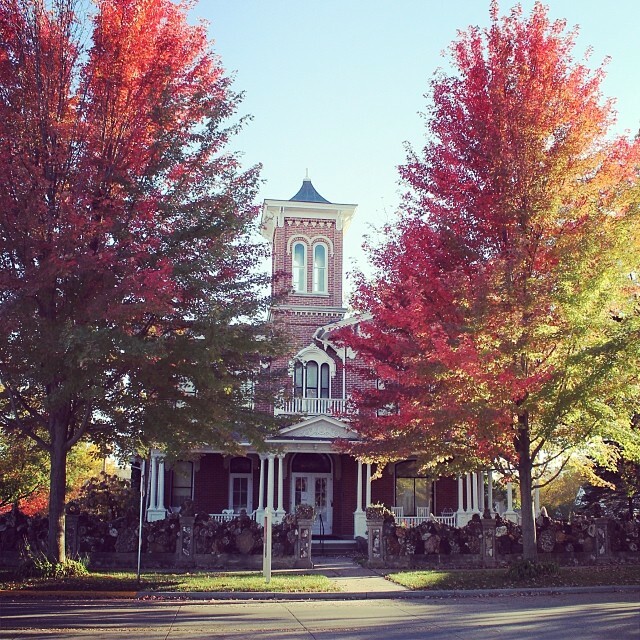 There was talk over the summer of taking a weekend trek to Mason City to tour the Stockman House and the Historic Park Inn, both of which were under construction a few years before our house was built. 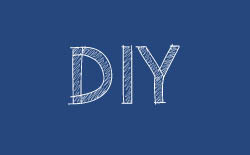 As it turns out, our own house projects trumped any plans for a road trip this summer. We finally had the occasion to make the 2 1/2 hour drive to Mason City last week. And while the extremely cold temperatures kept us from fully appreciating all that Mason City has to offer, we did get to tour the Stockman house. 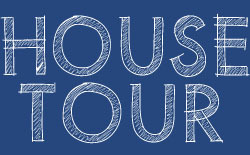 We’ve been particularly interested in seeing the Stockman House because it is very similar in design to our own home. Built in 1909, the Stockman is based on Wright’s fireproof home designs, which is a style that the architect relied heavily on when he was designing the American System homes. We were hoping to glean some tips on the restoration of our own home by visiting the Stockman house. And while we did get a few ideas from our tour, the real treat of the trip was stumbling upon a scale model of our own home. We had just walked into the Architectural Interpretive Center adjacent to the Stockman house and were trying to warm up when the docent asked us about our connection to Frank Lloyd Wright. “You mean this one?” the docent asked as she pointed toward a little house made of balsa wood. The fact that there is a scale model of our house is not a total surprise. 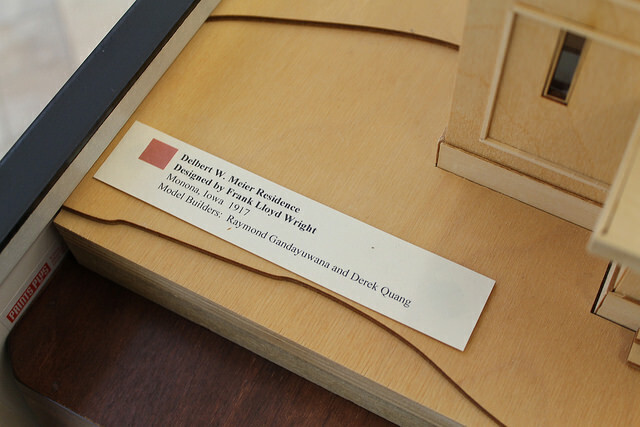 We knew through a previous email exchange with a professor of architecture that models had been created of all of the Wright homes in Iowa, including our American System Built home. We did not, however, know that the models still existed. And we certainly had no idea that the model of our house was on display in Mason City. What a wonderful surprise! 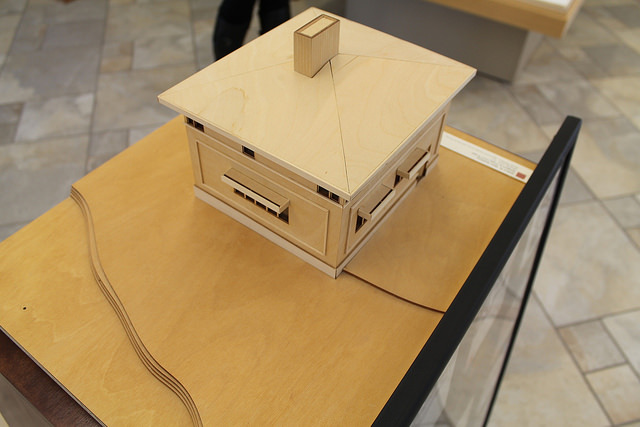 The model was built by Raymond Gandayuwana and Derek Quang and is a very accurate depiction not only of the house but the landscape surrounding it. From the windows to the trim and even down to the gradient in the landscaping, the model is an amazing representation of our home as it would have looked before the front facade was altered. 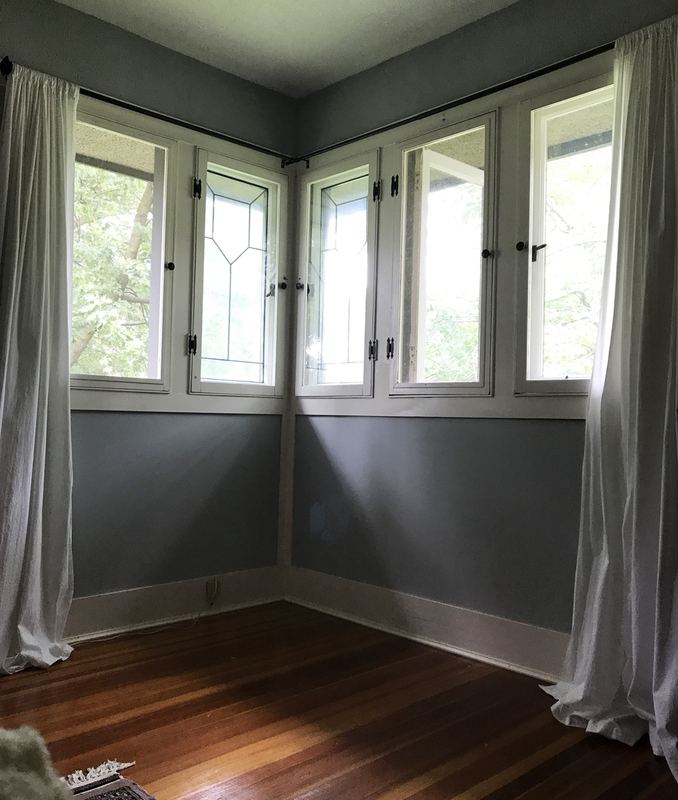 There is one window missing from the second floor of the model house, but why quibble over small details? 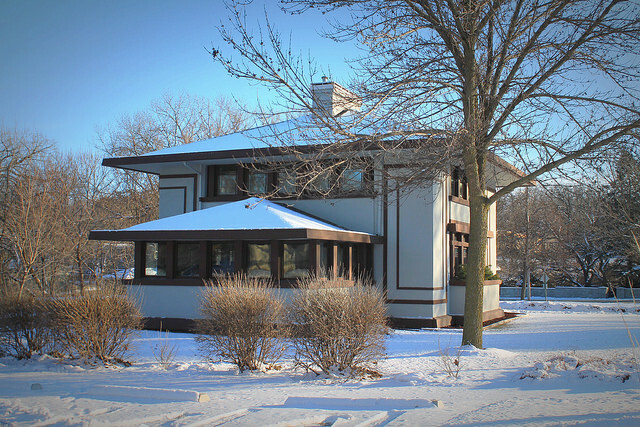 This entry was posted in American System-Built Home, Frank Lloyd Wright, iowa, Prairie School and tagged iowa, road trip on 01/05/2015 by Jason. Have you heard about the John Van Bergen-designed James Irving Residence? 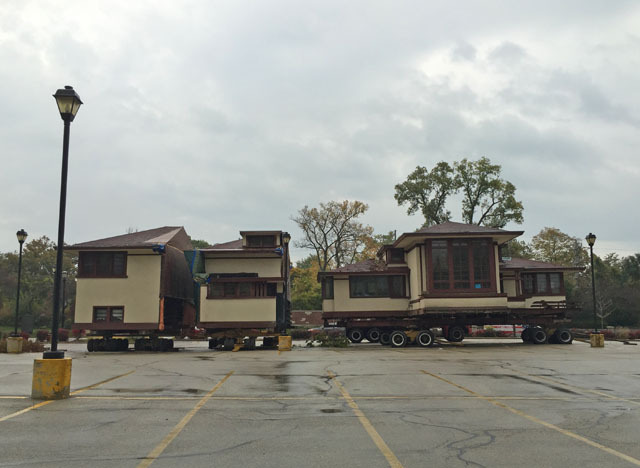 It’s a house on the move … literally! 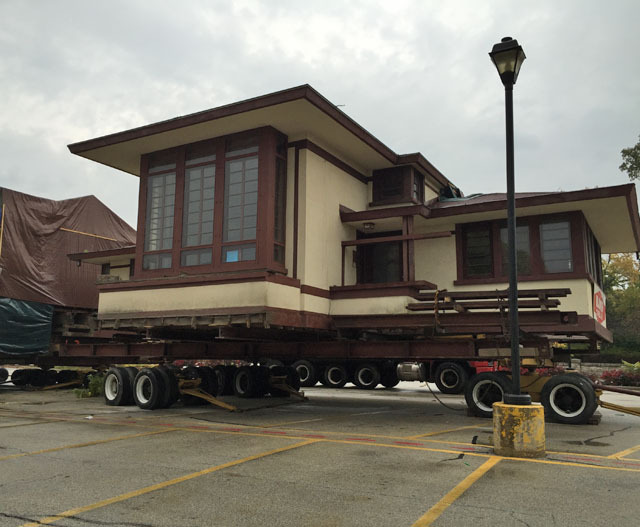 This architecturally significant house (Van Bergen worked in Frank Lloyd Wright’s studio) is being relocated from the Wilmette, Illinois site where it was built in 1928 to a new plot of land in nearby Evanston. They must’ve run out of milk on the way because the house is currently parked in the parking lot of a grocery store! 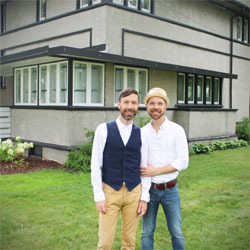 After a developer purchased the house and expressed intent to demolish it and build a new structure on the site, Christopher Enck purchased the Prairie Style structure and arranged its move. 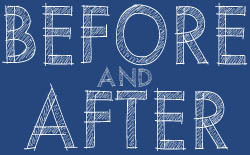 To make the move, which occurred over a three day period beginning last Friday, the house has been split into three sections. Apparently the house’s new site isn’t quite ready and so in the meantime it’s hanging out in the parking lot of an empty grocery store. The three sections of the house, with the exposed ends covered in big plastic tarps, sit on massive trailers in the parking lot of the former Dominick’s store on Green Bay Road in Evanston. 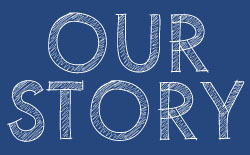 Isn’t it amazing that you can uproot a house from its foundation and relocate it? I mean, we usually think of houses as these immovable structures (at least we HOPE they’re immovable) so it boggles the mind to see that one can be cut up, lifted and carried away. Well of course The Mister just had to drive past the house and snap some photos. He was surprised to see that the house is really just sitting there in the parking lot, no fence surrounding it or guard protecting it. Does this mean that we can pick up This American House and move it back to the city? 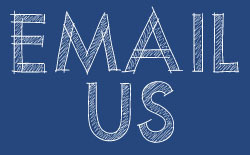 Um, yeah, probably not. 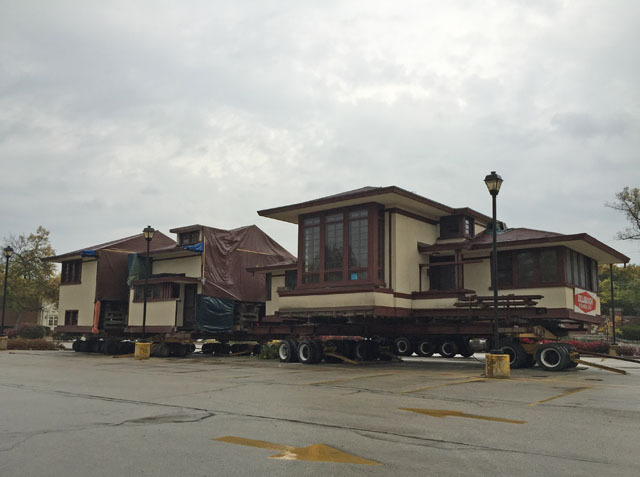 You can see a short video of the house being moved at the Chicago Tribune. 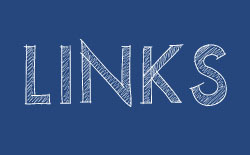 Evanston Now has a great recap on the move and the house. Wright in Racine also has a nice recap and photos of the move. 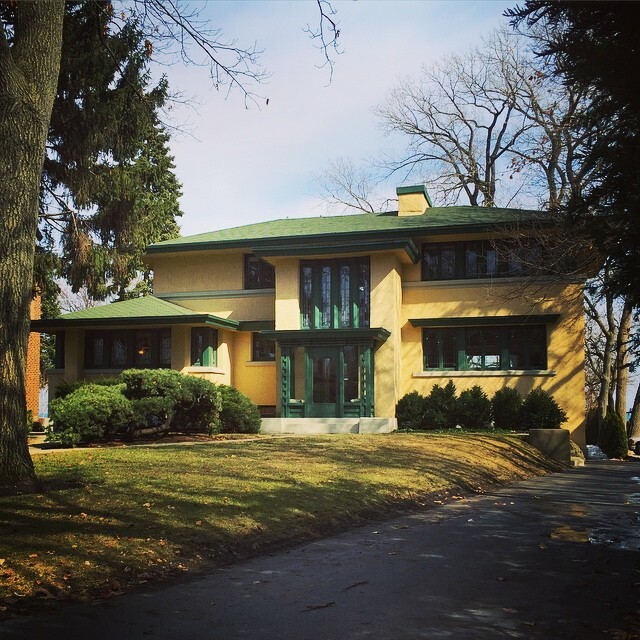 This entry was posted in architecture, city boys, Frank Lloyd Wright, Prairie School and tagged architecture, chicago, james irving on 10/14/2014 by Jason.